Teutsch: A teacher once told me that someone should hire her to design all of the chairs in the world. Raghav: Backrests, friend or foe? Teutsch: Children move so easily. In fact, it takes years to develop bad habits. Over time, people strengthen the wrong muscles. This lead to slouching and compression in the spine. 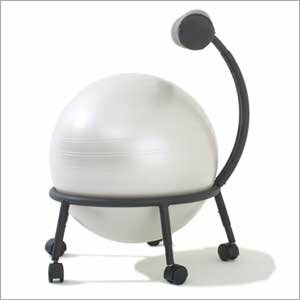 Raghav: Indeed, why not improve the physical and psychological health of our nation by producing chairs out of rubber balls? Teutsch: But that has a backrest! Raghav: I couldn't agree more. Teutsch: Raghav, thank you for your time. Oh and by the way, I really liked bits of that alexnder centre thing. In-ter-esting. Backrests = FOE! FOE! FIE on the FOE backrest!! i would like to get such a chair. I think that chair is really neat. Does the back rest go up and down as you bounce on the chair?